For those pressed for space or time, the only way to flex green fingers is with house plants, succulents and cacti. STEP 1: Put together a mix of cacti and succulents, of various ages and sizes. You’re looking for a pleasing level of variety that will mesh together and grow together to give the impression of a wild and natural garden. 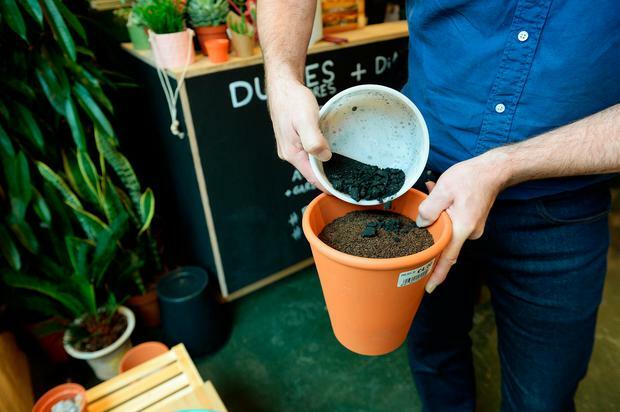 You’ll also need a gritty compost with lots of dry matter, some charcoal and perlite — a kind of gritty white, artificial volcanic stone. 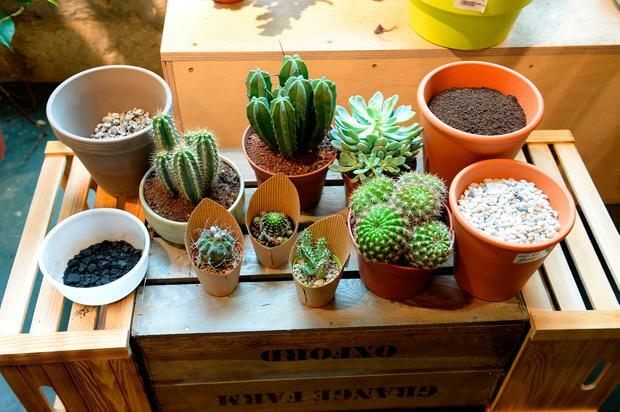 Cacti and succulents can be grown indoors or outdoors, depending on the species. These plants will be better as an indoor selection but they can still go out during hot weather. STEP 2: Prepare the soil. Putting in a good drainage layer is very important. 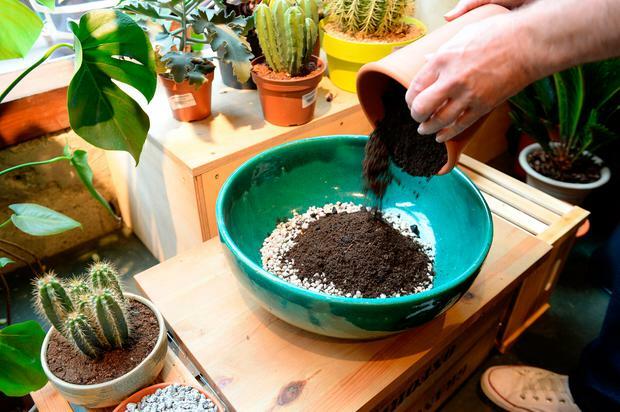 Ideally you need cactus and succulent focus potting mix, but you could also use a general household compost with something like perlite added to it. This should be mixed with some charcoal to filter and clean any gases that are emitted. STEP 3: Select your container and add drainage. Next select a container. Here we’ve used a jade green bowl that has been in the Gavin family for years. This is a temporary garden so, in time, these plants may grow out of this situation. Because this bowl doesn’t have drainage holes, it needs a layer of drainage pebbles at the base before the compost and charcoal are added. STEP 4: Plant the succulents. Place your succulents in the bowl first, distributing them as randomly as you can to best mimic how they might appear in nature. 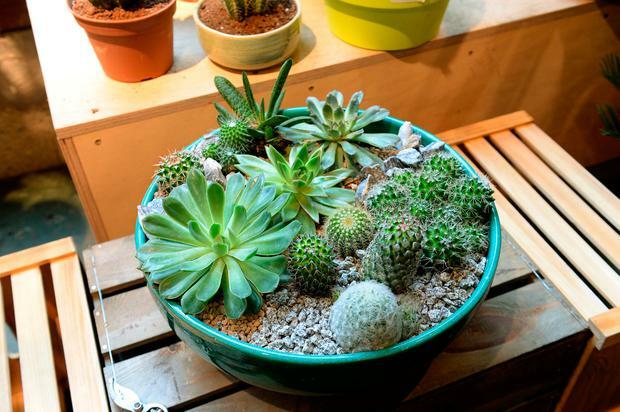 Unlike cacti, which are hazardous to handle, succulents won’t damage your skin. 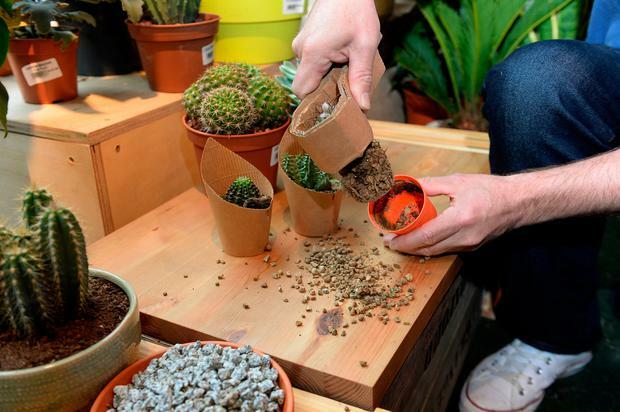 STEP 5: Handle cacti with care! Cacti have evolved to be very prickly so that no predators can get to them, but that translates into them being very awkward to handle for indoor gardeners. There is a trick you can use however: take a little cardboard collar and make a loop to put around the plant and tease it gently out of its pot, doing as little damage as possible to the roots. STEP 6: Tend to your miniature garden. Contrary to popular belief, cacti do need to be watered regularly, just not as regularly as other plants. The best thing is to get into the habit of giving them a drink once a week. During the growing season for cacti, usually during the summer, it is also a good idea to give some fertiliser. 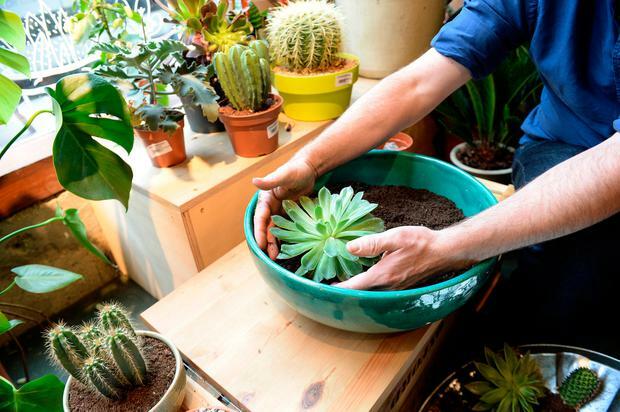 Succulents tend to have a winter growing season, so they should be fertilised then as well.